Deceptively, the desert can be full of amazing and life-inspiring fertility, such are the wonders of nature. Sacred sites have long been recognised throughout North America, and it’s only through a recent rediscovery or revival that they’re beginning to be widely acknowledged as channelling some serious energy. Yet it’s always been there – it’s just up to you to tap into the ebbs and flows of the seasonal, cyclical, and spiritual forces out there. Two examples stand out to mind, and both are centred in the deserts of California and Nevada – although while one is natural, the other decidedly man-made. Both are absolute must-sees, and for anyone interested in new age travel or just broadening their horizons, they come as much-recommended first-time or repeat experiences. Blooming from February to late April, Joshua Trees provide a creamy-white blossomed spectacle in the otherwise vast and seemingly inhospitable southern Californian desert. But beyond the springtime beauty of the site, the Joshua Tree National Park is filled with cultural and historical references that date back to the arrival of Paleo Indians to the region. Most of the 3,000 sacred Native American sites relate in some way to water, and Barker Dam is believed to have been an ancient initiation site due to the abundance of petroglyphs. The Joshua Tree National Park was selected as one of the New Age sites for the 1987 Harmonic Convergence, and even today the park is renowned for its all-encompassing serenity and peaceful atmosphere. Joshua Trees owe their name to Mormons crossing the Mojave Desert in the mid-nineteenth century, as their branches apparently conjured up an image of Joshua raising his arms to God. As the trees are only found in the U.S. states of California, Arizona, Utah, and Nevada, and primarily in the Mojave Desert (although the Joshua Tree National Park also encompasses the Colorado Desert), it’s best to access the prime tourist regions of the park through either California or Nevada. Located a mere 140 miles from downtown Los Angeles, or 195 miles from Las Vegas, it’s feasible to start your visit with a flight into Los Angeles or Las Vegas, and then to stay in Los Angeles, Las Vegas, or even San Francisco. While the fast times, furious fun, and bright lights of Las Vegas hotels and casinos might not be the first thing that comes to mind when thinking about mind-opening trips through amazing natural beauty and national park preservation, it’s still an eye-opening start to any vacation! The other unbeatable new age travel event is the annual Burning Man Festival, an innovative artistic experiment in community-building and festive celebration. Held in the Black Rock Desert in northern Nevada, it goes to further highlight that the “Silver State” isn’t just known for wedding chapels and gambling. 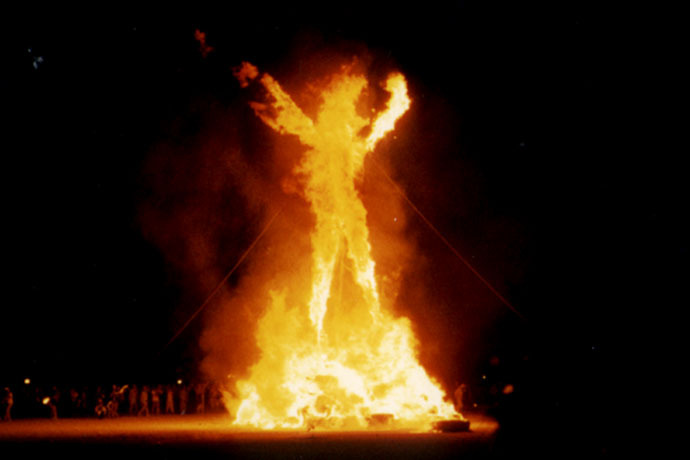 What started as a mid-1980s solstice celebration of burned effigies has become a major form of radical self-expression, culminating at the end of the eight-day desert festival with the incineration of the Burning Man effigy. Encouraging a ‘leave no trace’ policy, the entire site-specific Black Rock City is assembled and dismantled for the event. However, the team behind Burning Man claim that any further explanation is verging on the impossible, as ‘trying to explain what Burning Man is to someone who has never been to the event is a bit like trying to explain what a particular color looks like to someone who is blind’ – so we’ll just have to leave it up to you to experience it for yourself and then attempt to put it into words!